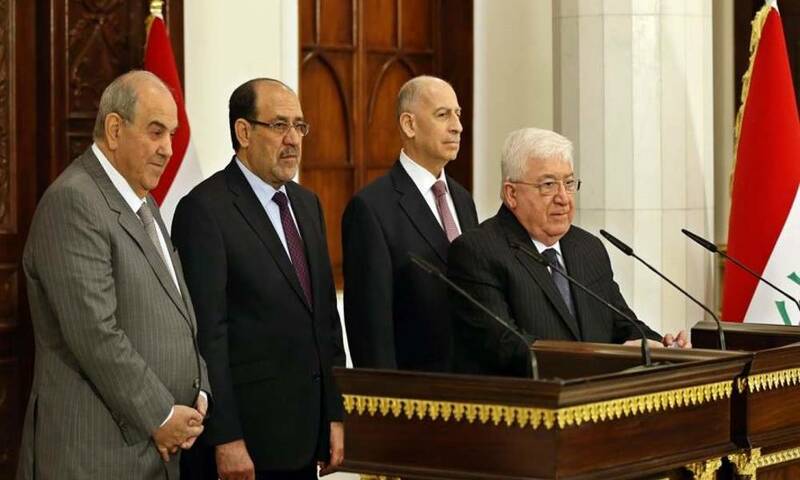 The Ministry of Justice, the issuance of several decrees Republic includes the referral of former President Fuad Masum and his deputies Nuri al-Maliki and Iyad Allawi and Osama Najafi to retire. The latest issue of the Iraqi newspaper “Al-Oqayyat” No. 4512 issued by the Ministry of Justice on Monday, several republican decrees, including the appointment of “Barham Ahmed Saleh” as President of the Republic of Iraq, and referral of former President Fuad Masum and his three deputies to retire. According to the newspaper, Republican Decree No. 71 of 2018 appoints Barham Ahmed Saleh as President of the Republic of Iraq and Presidential Decree No. (72) of 2018 referring Mohamed Fuad Masoum Khader, President of the former Republic of Iraq, to ​​retirement and Republican Decree No. 73 of 2018, Vice President of the Republic to retire, and presidential decree No. (74) for the year 2018, referring to Osama Abdul Aziz Nujaifi Vice President of the Republic to retire, and Republican Decree No. (75) for the year 2018, referring Iyad Hashim Allawi, Vice President of the Republic to retire.